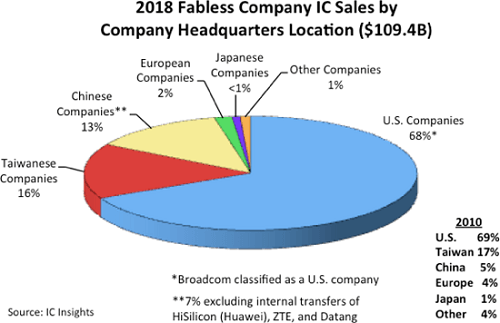 U.S. companies continue to dominate fabless IC sales, according to IC Insights, holding 68 percent of market share with contract fab services. China has gained market share in the fabless IC market, increasing to 13 percent in 2018 from 5 percent in 2010. In 2018, IC Insights reported, four of the top five fastest growing fabless IC companies (with greater than $200 million in sales) were Chinese companies (BitMain, ISSI, Allwinner, and HiSilicon). However, when excluding the internal transfers of HiSilicon (over 90 percent of its sales go to its parent company Huawei), ZTE, and Datang, the Chinese share of the fabless company IC sales drops by about half to 7 percent. European companies held only 2 percent of the fabless IC company market share in 2018 as compared with 4 percent in 2010, the research firm reported. This loss of share was partly due to the acquisition of U.K.-based CSR, the second-largest European fabless IC supplier, by U.S.-based Qualcomm in 1Q15 and the purchase of Germany-based Lantiq, the third-largest European fabless IC supplier, by U.S.-based Intel in 2Q15. These acquisitions left U.K.-based Dialog ($1.44 billion in sales in 2018) and Norway-based Nordic ($271 million in sales in 2018) as the only Europe-headquartered fabless IC suppliers in the top 50-company ranking last year. There was only one Japanese firm in the 2018 top-50 fabless supplier ranking—Megachips, which saw its sales jump by 19 percent in 2018 to $760 million. The lone South Korean company—Silicon Works, had a 17 percent increase in sales last year to $718 million. Worldwide fabless IC sales increased by $8.3 billion in 2018, IC Insights said, which represented an 8 percent increase from 2017. In total, 16 of the top 50-fabless IC suppliers had better results than the global 2018 IC market increase of 14 percent. Overall, 21 of the top 50 fabless IC suppliers registered double-digit growth rates last year while five companies logged double-digit declines. Five fabless companies—China-based BitMain, ISSI, Allwinner, and HiSilicon, and U.S.-based Nvidia—registered ≥25 percent growth in 2018. The fastest growing fabless IC supplier in 2018, at 197 percent, was China-based BitMain, which has had a very interesting past couple of years. IC Insights noted that labeling BitMain an IC supplier is a bit misleading. BitMain is an electronic system supplier of cryptocurrency mining equipment. Since the company does not sell individual ICs on the open market, its IC “sales” are similar to those IC Insights lists for Apple, with BitMain’s IC sales essentially being the value of ICs it purchases from its sole-source foundry—TSMC. It is estimated that BitMain held an 84 percent share of the $5.0 billion worldwide cryptocurrency mining equipment market in 2018. The company had a meteoric rise in its sales over the past three years. BitMain’s total sales were $278 million in 2016, $2.5 billion in 2017, and an estimated $4.4 billion in 2018. The company’s equipment sales are very closely tied to the price of cryptocurrencies, especially Bitcoin. With the crash of Bitcoin prices from $18,000 in January 2018 to $3,500 in December 2018, IC Insights estimates BitMain’s total sales went from a company-published $2.8 billion in 1H18 to $1.6 billion in 2H18. IC Insights believes that BitMain’s steep rise and fall in cryptocurrency mining equipment sales since 2016 is responsible for the majority of the volatility of TSMC’s China-based foundry sales over the past two years.